Meditating upon these aspects, due to the great urge, he set out to reach him and those who care for him became immersed in his such act. AzhwAr is speaking about this in the mood of a mother [those care for him] of a woman [parAnguSa nAyaki, nammAzhwAr in feminine mood] who is grieving in separation of sarvESvara (lord) and in great urge set out to go to his abode thirukkOLUr as a woman who goes to meet her beloved. In the previous decad, seeing her daughter parAnguSa nAyaki’s grief in her unconscious state, her divine mother cried out emperumAn’s divine name saying “she lost this, she lost that” and herself became unconscious; hearing the divine name, parAnguSa nAyaki regained consciousness and started walking towards thirukkOLUr; her divine mother sensing that, saw the mattress they were resting on; it was empty; now, she determines that her daughter left to thirkkOLUr due to having been born to her [having the same nature], her nature and due to her routine while being in this material world. In the previous decad, she hoped that she did not lose her daughter even if she [daughter] lost her bangles etc. In this decad, she cries out saying that she has lost her daughter as well. In ALavandhAr’s assembly, a question was raised as to who should one fear for mos – is it for the pirAtti (parAnguSa nAyaki, nammAzhwAr’s feminine form) in “uNNunjORu” or for the pirAtti (parakAla nAyaki, thirumangai AzhwAr’s feminine form) in periya thirumozhi 3.7.1 “kaLvankol“? The learned SrIvaishNavas said “Should we fear for the one [parakAla nAyaki] who went along with emperumAn as a pair [in kaLvankol]? Should we not fear for the one [parAnguSa nAyaki] who went on her own!”. ALavandhAr refuted them and said “It is not like that! Since they went as a pair, we should fear for both of them; for the one who went on her own, is there anything to fear?”. 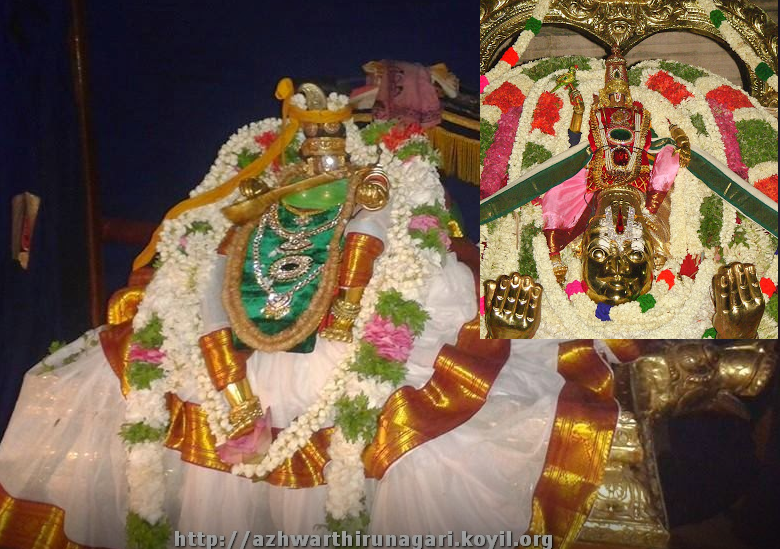 The reason for this is – as both [parakAla nAyaki and emperumAn] are crazy for each other, they would not know what happens around them [so we should fear for them]; but parAnguSa nAyaki cannot sustain without reaching thirukkOLUr [so, she will surely reach there and we need not fear for her]. [One more explanation] There the fear is in thinking if they would reach thiruvAli dhivya dhESam or if they would end up in lankA [like it happened in SrI rAmAvathAram]. Yet, wherever they go, they will go as a pair; here, the divine mother cries out with unbearable grief saying “How is she going to manage on her own!”. This decad explains how AzhwAr gave up attachment to sensual pleasures as said in thiruvAimozhi 3.2.6 “aRpa sArangaL avai suvaiththu aganRozhindhEn” (I have gone far away by enjoying very insignificant pleasures) and ensured that he will be part of bhAgavatha gOshti, and he gave up worldly people as said in thiruvAimozhi 10.6.2 “nAttArOdiyalvozhindhu” (giving up attachment to worldly people) to guarantee that he is not one among the materialistic people and set out to enjoy the great bliss as said in thiruvAimozhi 4.7.2 “koLLa mALA inba veLLam” (unlimited flood of bliss). AzhwAr who secretly chased after sensual pleasures which would lead one to hell, is now secretly chasing the matter [bhagavAn] which is apt for one’s true nature. AzhwAr who would chase lowly matters without fearing about any blame, is now chasing greatly auspicious emperumAn, without fearing any blame. parAnguSa nAyaki’s mother is saying “I will also enter the same place where my belonging [daughter, parAnguSa nAyaki] has gone”, as said in SrI rAmAyaNam uththara rAmAyaNam “lakshmaNEna gathAm gathim” (SrI rAma says – I will follow lakshmaNa to his destination). sarvAn bhOgAn parithyajya – She gave up everything – those she liked previously and her parents, and left. parithyajya – She fully eliminated the attachment thinking “there should be no scope for future attachment”. bharthru snEha balAthkruthA – When one becomes attached to something, he/she will lose interest in everything else; she was not in her control while leaving. achinthayithvA dhu:khAni – While she may not have thought about what she gave up here, did she at least consider the sorrow she may incur where she arrives? Since sIthAp pirAtti did not think about herself and was only focussed on SrI rAma, she did not have to think about any sorrow. pravishtA nirjanam vanam – She only considered it [the forest] being “a secluded place for enjoyment [with SrI rAma]”. SrI rAmAyaNam ayOdhyA kANdam 42.31 is also explained. puthra dhvaya vihInam thath – Emperor dhaSarath searched for his two sons and became greatly grieved. snushayAcha vivarjitham – As they left with great wealth [sIthAp pirAtti, his daughter-in law] -to make him not think “they will like to come back here”. apaSyath bhavanam rAjA nashta chandhram ivAmbaram – It appeared like a sky which is devoid of moon [SrI rAma], moonlight [sIthA] and collection of stars [lakshmaNa]. parAnguSa nAyaki’s divine palace too appears like this. Her divine palace appears as said in periyAzhwAr thirumozhi 3.8.1 “nalladhOr thAmaraip poygai” [periyAzhwAr singing in the mood of a mother whose daughter left her to go to krishNa]. The divine mother became upset seeing her divine palace and said with great displeasure [highlighting the important aspect of every pAsuram in this decad] “If she became determined to go, should she not take me along also! Why did she go alone! Even if she does not take me along, should she at least not go along with him! How is she going to go! Is she uplifting everyone while going there! How will she manage after reaching there! What will she hear from others en route! Is she going to be pleased on seeing the gardens, ponds and emperumAn’s qualities after reaching there? Is she becoming weak seeing him there! Thinking ‘I can find out about these only if I too go there!’, she left us without seeing herself [her tender nature] or [the suffering of] us, as if sinking everything in the ocean”. This entry was posted in thiruvAimozhi, thiruvAimozhi 6th centum on March 3, 2018 by Sarathy Thothathri.